In this house we do a lot of baking....A LOT! We go through vanilla extract like water flour. Instead of running to the store every time I finish a tiny little bottle, or standing in the baking isle wondering if I have enough extract at home, I started making my own. Now I always have a stock of it. 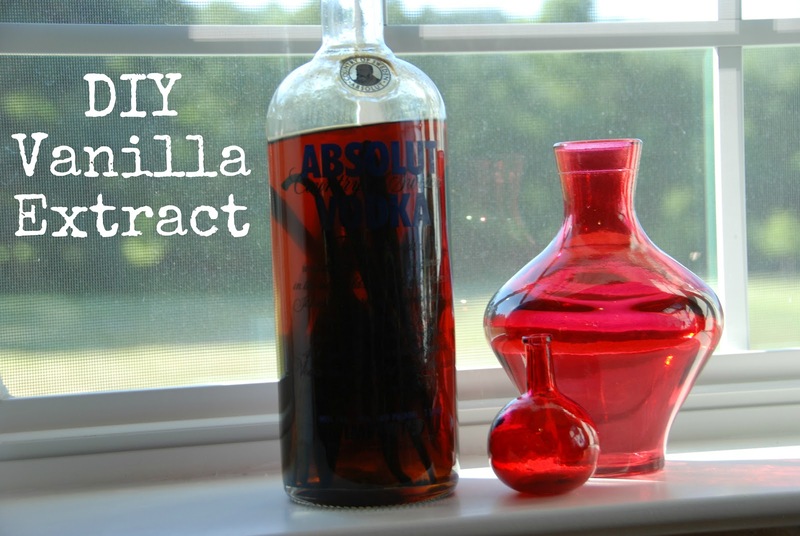 You only need three things; vodka, vanilla beans, and a glass bottle with a tight fitting lid. I purchase my vanilla beans from Olive Nation. I have had great success with their Bourbon Madagascar vanilla beans for many things, so they are my go to bean. The ratio is about 3 vanilla beans to 1 cup of vodka. Split your vanilla beans by cutting them lengthwise with a sharp paring knife. Taking care to leave the ends intact (leave about 1"-1.5" at the ends connected). Place the beans into a glass bottle and cover with vodka. I just use the bottle the vodka comes in, but mason jars work well too. As long as the bottle/jar has a tight fitting lid you are in good shape. Store the bottle in a dark cabinet for about 2 months, maybe longer depending on how many beans you use. You need to shake or swirl the bottle every once and awhile (I do it about once a week), so be sure to keep it somewhere that will jog your memory. You can top off your bottle with more vodka as you use it, just be sure to shake it well after the addition of vodka. I like to have multiple bottles going so when I top off one bottle it can sit for a few weeks while I use a different one. I have been told that you can use it right after you add more vodka, but I like to live on the safe side. This extract will last you for years if you keep topping it off. Plus, you will never have to stand in the grocery store wondering if you have enough vanilla extract again. I love this idea! Can't wait to try it. I am hoping to have some made in time for holiday baking!